Benefits of Shopping Center Pressure Washing - Pro Wash, LLC. If you manage a shopping center or strip mall, you have more than likely run into the need for shopping center pressure washing. This article will give you some insight into the service, and will help make choosing a qualified contractor easier for the management team. 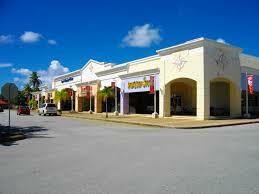 Shopping centers and strip malls are busy environments where loads of people enter and exit daily. With all those people comes all that debris, gum, stains and general mess associated with high traffic areas. Although many commercial property managers are working with a meager budget due to high vacancy rates, shopping center pressure washing is still a very needed service and should not be one that is underestimated. The small investment cost of quarterly pressure washing at a shopping center or strip mall has more impact to end consumers than most may realize. Not only are the current businesses happy because their entrances, walls, and windows are clean, the entire structure is more inviting to potential tenants, which increases the odds of new tenants filling in those empty spaces. Shopping center pressure washing may include the sidewalks, walls, columns, building exterior, roofs, canopies, and windows. The majority of shopping centers have the concrete sidewalks pressure washed and windows cleaned at quarterly intervals. Other areas are typically cleaned on an “as needed” basis. 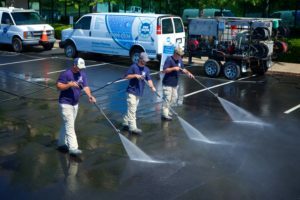 When selecting a pressure washing company for Nashville area shopping center pressure washing, look for the following items to ensure that they are knowledgeable and can handle the task at hand safely and efficiently. Truck or trailer mounted equipment– You don’t want to see a handyman rolling a pressure washer out of his truck bed to clean a strip mall’s sidewalks. The proper hot water pressure washing unit for this type of work weighs more than one man can push around. Also these machines are usually too small to run a surface cleaner attachment, which increases efficiency and creates a uniform cleaning pattern. 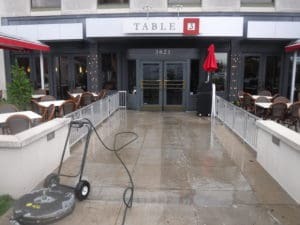 References and pictures– An experienced commercial pressure washing company will have several references as well as before and after photos of shopping center pressure washing. Look for more than just concrete cleaning. A professional power washing company should be proficient in soft washing, window cleaning, gum removal and building exterior cleaning. Online reviews– Look for customer reviews on a credible platform. Google reviews are great because they require the person leaving the review to log in, reducing the chances of fake reviews. Also, take a look at the company’s Better Business Bureau rating. What Are The Benefits of Shopping Center Pressure Washing? Overall, keeping a clean shopping center is a small investment with a big payoff. Tenants, customers, vendors and management will appreciate the the lack of spider webs on the ceiling and chewing gum on the concrete. It is a wise choice to set up regular cleanings on a dedicated schedule. It is easier to budget for 4 cleanings annually versus an “as needed” basis. Since the weather patterns in the Nashville area include freezing temperatures in the winter months, it is a good idea to schedule a cleaning for late fall as well as early spring so that a cleaning is not needed during colder months. This eliminates the chance of creating ice, which we all know is a bad situation waiting to happen. If, however pressure washing services are needed during the winter months, here is a good article that shows what is involved. Winter pressure washing in Nashville.